Looking to Rent an Interactive Touch-Screen? 22 Dec Looking to Rent an Interactive Touch-Screen? Touch-screens are engaging and bring your digital content to the next level. Screens can work on your behalf gathering information from potential customers at trade show booths or expos. This is great, but when it’s time for your interactive touch-screen rental which one should you choose? This area of touch-screen rental technology has moved on a lot over the last few years. The biggest changes have been in screen technology. Thin lightweight LED screens are now available with ‘touch enabled’. This means larger surfaces, more modern design, higher image quality, multi touch facility & more on board features. 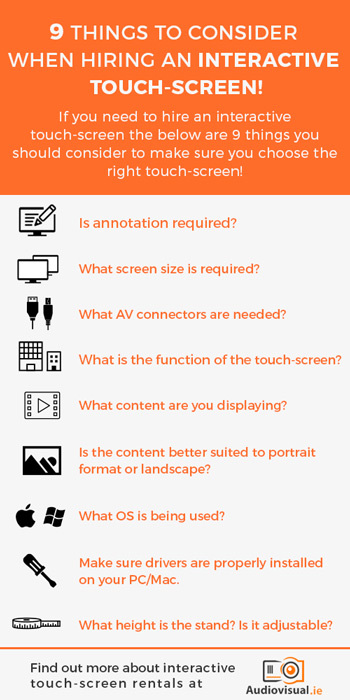 What To Consider When Hiring An Interactive Touch-Screen? Touch-screens allow you to control the PC / content you are displaying by simply touching the screen with your finger. This can be used for browsing, form filling, way finding, software demoing and many other uses. Text is inputted using an onscreen keyboard. Some Interactive Touch-screens support annotation and will allow you to write on screen over computer & video content. (Pausing a video and annotating over it is a pretty cool feature.) You can also save / print & email these annotations straight from the screen. Screen sizes vary typically form 42” to 70”. AV Connectivity is extensive with generally HDMI or VGA used. Put some thought into the content you are displaying. Is it a web Page? Maybe some custom designed flash software? A flipping book also works very well. Is the content better suited to portrait format or landscape? Windows8© & Windows10© operating systems do not require drivers to be installed. They will automatically work without calibration also! – this saves time & effort. Make sure you have installed drivers on your PC or Mac. Make sure you have the correct drivers installed and ideally test in advance. Have your AV company email you drivers in advance and have them pre-installed. Some touch-screens have embedded android PC’s which provide enhanced functionality such as video playback, annotation, running Apps, web browser etc. This is very handy. What height is the touch-screen stand? Is it height adjustable? When hiring touch-screens it is best to call out and test your laptop & digital content in advance of the rental. Make sure drivers are installed, touch interactivity is thoroughly tested and optimum resolutions and any other little glitches which may arise are identified and rectified. N.B. Make sure you have admin rights to add touch drivers to your company laptop if doing it onsite! If you have any questions about interactive touch-screen rental feel free to comment below and I’d be happy to answer. If you need to rent an interactive touch-screen then call us on +353 1 4133892, contact us online or email me directly ivan@audiovisual.ie and be happy to sort you out. Pingback:The Definitive Audio Visual Checklist | Free Download!